The Sacrificed hails from Central Florida and deliver up a Metal feast of Power Metal offerings. Back in 2005 Eli Prinsen (former vocalist of Sealed Fate and Sceptre) met Johnny Bowden (Guitarist of The Undisputed). Although the two came from very different backgrounds musically, they shared a love for Jesus Christ as well as many similar musical interests. The two set out to fuse together Eli's classic/power metal vocal style along with Johnny's driving punk/metal guitar style to create a modern style of metal with a strong classic power metal feel...What resulted was what is now known to Christian metal fans as "The Sacrificed". 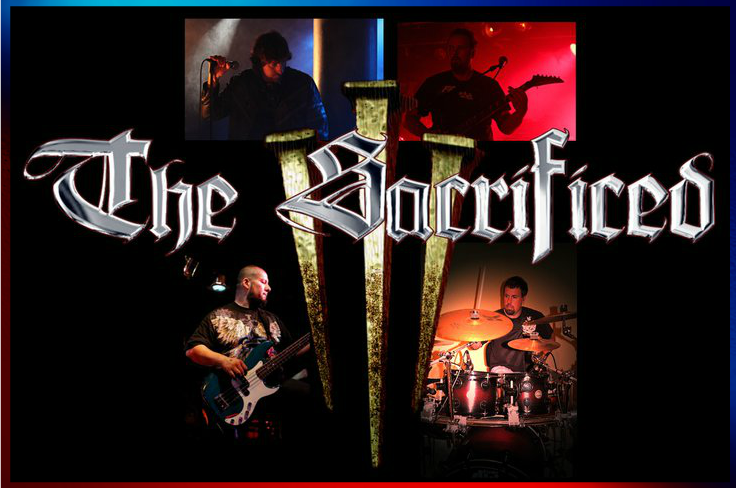 The Sacrificed are a fusion of classic power, progressive and modern metal guitars with classic multi octave Power Metal Vocals. The Sacrificed are often compared to Queensryche, Iron Maiden, Sacred Warrior, Haven, Deliverance and Helloween. The band has to their credit three releases 2007-'The DaVinci Hoax' , 2010-'2012', and 2012-'III'. ​ After the successful release of their 2010 sophomore album, to the delight of their fans, The Sacrificed returned with their highly anticipated 2012 junior full-length album simply titled 'III'. The Sacrificed is not trying to hide anything about their faith when it comes to the cover's artwork on this 2012 release. Jesus was sacrificed and nailed to the cross by three nails and the penalty for our sins was placed upon him. ​ With the release of their 'III' album, the band has made obvious changes to their Power Metal sound. Most of the changes are in direct connection with the guitar department. The band saw a line-up change as Guitarist Johnny Bowden left and was replaced by guitarist Michael Phillips(Deliverance). With the implementation of a new lead guitarist, the band's sound has drastically changed. The sound went from a groove oriented Power Metal sound with no lead guitarist to a lead guitarist driven heavy Power Metal sound. As an additional bonus, Roy Z(Rob Rock) makes a guest appearance on the album and takes position as lead guitarist on the tune "Ark Of The Covenant". Behind the kit we find some killer drum lines being laid down by Drummer Jay Williams who does an impressive job with the blast beats and the double bass attacks. The percussion team is rounded out by Daniel Cordove(Vengeance Rising) who lays down some heavy bass lines for the band on this project. Upon the release of 'III', there was excitement in the air until fans spun the disc in their CD-players and heard the problems with the mastering which in turn covered up the Vocal work of Eli Prinsen. To the dismay of the band, there was some bad reviews about the "mastering" issue being released as well. Ever since the release of The Sacrificed "III" album, there have been complaints about the vocals being buried in the mix. I too have felt this same way. Now that the band has the rights to the album back, I am releasing a special UNMASTERED EDITION of The Sacrificed - "III". Now our fans can hear it the way we did in the studio, before sending it off to the mastering house, with the vocals nice and loud/ front and center!" In 2015, to the delight of disappointed fans, The Sacrificed re-released their 2012 album in the Unmastered form. The band has titled this 2015 re-release 'III-Unmastered Edition' . With this release listeners get to hear the album the way it sounded before sending it off to be mastered. With the original 2012 'III' release, it sounded as if Eli Prinsen was singing in a bubble so to speak. However, with their 2015 Unmastered re-release, the Vocal work sounds as if the bubble has been popped and we now hear the album how it was meant to be heard with Eli's vocals up front and center where they should be. This also had an effect on the overall sound of the album allowing us to hear the lyrics and the instruments much clearer. Not only is this album heavy musically but it is equally heavy lyrically. 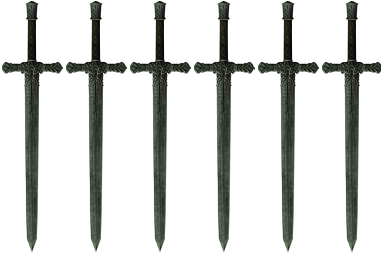 The word of God can be like a double edge sword that often hurts when it penetrates deep into our belief systems, our lives, and our sinful hearts. For some, it is hard to accept or hear the truth and with that said, we find that Eli Prinsen states: “Don’t take my word for it, do your own research, seek the truth through prayer and your eyes will be opened”. Will the fallen ones return from the sky to deceive? 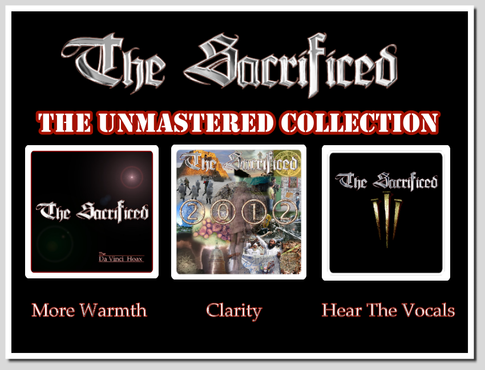 The Sacrificed has re-released all three of their albums in the Unmastered form. If you love Power Metal that is uncompromising in every aspect then I believe you will find The Sacrificed III Unmastered album a killer project. Some bands similar to The Sacrificed are Queensrÿche, Sacred Warrior, and Worldview just to mention a few. Lets just hope we haven't heard the last from this great band.